This time I’m here to talk about L-email Wigs. 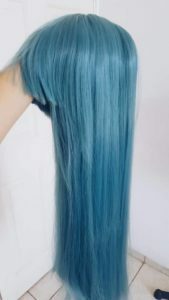 This company offers cosplay wigs and costumes with great quality and tons of different style, so if you’re looking for something in specific this place can be super useful for you. For my Morrigan Aensland wig I choose the 100cm Super Long Aqua Anime. This was a tough choice because this character changes her hair color like all the time, and every artist draws her with different blue/green hair, so I based my choice on the design of Marvel vs. Capcom 3: Fate of Two Worlds. Shipping was super fast, less than a week, the wig net is adjustable and comfortable to wear it stretches easily so that it can fit every head size, The bang is quite long, and gives wide freedom of adaptation to different face shapes before I cut it to make it look like Morrigan’s hair and the best part is that I’ts a lot of hair so there’s no part in the head where you can see your own hair or the net. I’ve always liked this character and the Darkstalkers game in general, so I’m planning on doing all versions of her, starting with the Nurse one. The wig is super great product. If you’re looking for a wig to cosplay Morrigan but can’t decide on which one to buy, this one reveals to be a really good option, it’s also very affordable. I hope this review helps you make the right decision for your Morrigan wig! 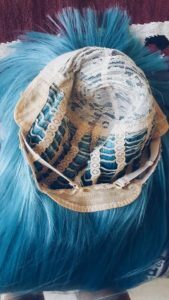 This entry was posted in Buy Cosplay Wigs, L-email Wig review, Wigs and tagged best cosplay wigs, cosplay wigs, L-email wig review, Wig-supplier.